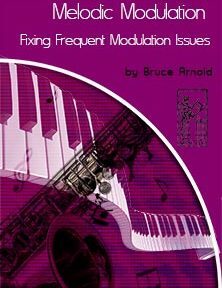 Melodic Modulation Fixing Frequent Modulation Issues is a course of study to help a student control modulation tendencies when doing melodic dictation. This course works both on maintaining a key center as well as learning how to follow or control when one modulates within a melodic line. Melodic Modulation Series has Three Different Courses. Melodic Modulation Series has Three Different Courses plus a Bundle which contains all three courses. “Melodic Modulation” looks at the tendencies of a melodic line to modulate to other key centers. Modulation can be a good and a bad thing when it comes to ear training. If a student modulates too much they run the risk of having difficulty processing single line melodies. Many beginning students of ear training have this exact problem wherein they modulate too much. This can caused by a number of factors some of which are; overtraining with intervals and inexperience with various styles of music, to name a few. As a general observation ear training students tend to modulate less; as their ear improves, stability improves. So you may find that examples found in this book may modulate today, but six months from now might not. Don’t be surprised if this happens. Another common mistake that students make is to use their understanding of music theory to decide which key an interval or melody is from. Always let your ear decide how it is hearing something, not your intellectual knowledge of music theory. It is often assumed by a student of ear training that if they just complete a certain type of exercise all their problems will be solved and they will be able to hear music in all situations. Nothing could be further from the truth. Developing a high level of ear training skills where you can identify any type of music is a multi-year process and it involves using a variety of methods to reach that goal. This is one of the reasons that the Muse-Eek Publishing, Inc has so many different kinds of ear training products. But again, a student must listen to, and if possible play, many various styles of music, so that they understand it on a visceral level. The “Melodic Modulation” courses contain multiple types of melodies. This is important because the construction of a melody will great determine your ability to hear it and whether it has a tendency to modulation. The “Melodic Modulation” courses are frequently updated with more melodic exercises to make sure that a student is exposed to as many types of melodies as possible. The Bundle offers the two, three and four note group courses together in one purchase. Melodic Modulation Two Note Groups covers two note melodies and is a great way to introduce yourself to this course of study. Melodic Modulation 288 two note melodies. Melodic Modulation two note melodies moving by common tone. These melodies can be highly chromatic and/or intervallic in nature. Melodic Modulation two note melodies with approach notes in all keys. These melodies are great for outlining chords but can also be very challenging if superimposed. Melodic Modulation Three Note Groups covers three note melodies. With three note melodies the number of combinations for any melodic figure gets quite large. This three note course presents you with near a 1000 pages of singing exercises. Melodic Modulation three note melodies using all possible intervals within a three note group. Melodic Modulation three note melodies using common tone movement through all 12 three note pitch class sets. A great singing exercises but also a great improvisational concept first used by John Coltrane. Melodic Modulation three note melodies using three note chromatic approach note figures in all keys. A bebop technique developed by Charlie Parker is also a great way to hone in your key center abilities. Melodic Modulation Four Note Groups covers four note melodies. Four note melodies are some of the most common types of melodies and this course explores many of the melodic combinations found using four notes. Over 2800 page of examples. Melodic Modulation four note melodies using all possible intervals within a four note group. Melodic Modulation four note common tones melodies using the 29 possible four note pitch class sets. Again excellent for singing and for improvisation. Melodic Modulation four note approach note melodies to Major Chords ala Charlie Parker in all keys. Excellent for key center practice especially when superimposed. Melodic Modulation four note approach note melodies to Major Modes ala Charlie Parker in all keys. Excellent for key center practice especially when superimposed. This entry was posted in Ear Training and tagged Melodic Modulation by Muse Eek. Bookmark the permalink.